If you’re a fan of Scentsy, you already possess the most important trait of a Scentsy Consultant. Love of and belief in these amazing products make you the right person to sell them. Whether you’re looking to be your own boss, bring in some extra cash or simply share these great fragrances with others, as a Scentsy Consultant, you’ll have the flexibility to sell and gather orders as fits your needs and lifestyle. LoseTheFlame and go wickless! Please join our Live Chat and ask me questions about selling Scentsy, don’t wait, the holidays are just around the corner! Want to become a Scentsy Consultant but don’t want to have Home parties? You really don’t have to. When you sign up to sell and become a consultant, you can gather orders from friends and family or you can have a Scentsy catalog party and share our mini tester kit (80 small tester samples) with your customers. 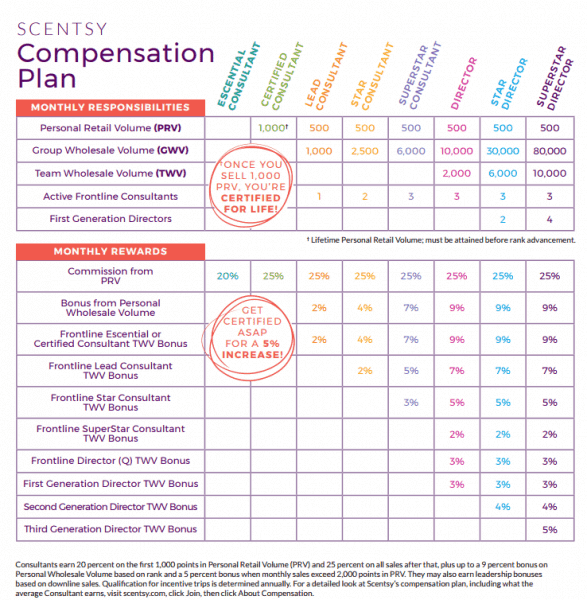 Scentsy Consultants must generate sales resulting in 200 points or more in PRV in at least one month within any contiguous three-month period. The 200 points in PRV can come from individual customer orders, party orders or online orders made through your Personal Website (PWS). It doesn’t matter how you place the orders, or if your customers do, the requirement is the same. Scentsy has elevated the home-based direct-sale business to a model that adapts to the 21st century world. Home parties of years past aren’t the be-all and end-all of generating sales. Online orders and catalog sales may be all you need for a successful business. Home parties are still an option if that works for you and your customers. It’s fun to sell Scentsy and share it with others, it doesn’t feel like work. Sitting around smelling the different sent testers and picking your favorites doesn’t seem like a hard sell. The drawback to many home, direct-sale businesses is the money you have to front for products you keep on hand. With Scentsy, $99 is all you need to get started. In the U.S., that gets you a kit with 80 fragrances featuring a good variety of the brand’s offerings, several promotional products like a car freshener and room spray, as well as supplies to get your business up and running, including a start-up guide, order forms and business cards. From there, you don’t have to keep an inventory of products that you hope to sell. You order the items when your clients request them. Every sale earns you a 20% commission on the 10th of the following month. Reach certain monthly goals and earn up to 30% commission. Enlist others to sell under you, and earn 9% commission on their sales. It sounds cliché , but with Scentsy, it’s true – you aren’t just a cog on a giant wheel; you’re part of a team, a family that helps and encourages each other to do better. I have hundreds of consultants around the world working under me and we keep in touch, swap ideas, and offer suggestions through a Facebook group. As a Star Director, I enjoy and have confidence in my ability to train new Scentsy reps. But one of the great aspects of the company is how involved they are in making you the best consultant you can be. Still unsure? See my Top Ten Reasons to Join Scentsy and you won’t be! Is it easy to sell? I’d love to tell you how easy it is, but it’s really based on the amount of effort on your part. If you love the product and put a little time into letting everyone you know and meet about the new product that you found and love, you’ll be amazed at how easy it is to sell our candle warmers and scented candle bars. Like with any job, you do have to show some effort and market yourself a little. Remember, you don’t have to have home parties, you can always make sure that your friends and family have catalogs and let them know that you have all the testers for them to stop by and smell. It’s more of gathering orders instead of trying to get a selected 25 people to your house at the same time. People are extremely busy and sometimes not able to get away from home. I think that’s why a lot of the home direct selling businesses don’t work, they’re focus is on the home party only. Things have change dramatically since the first Tupperware party and the home party isn’t for everyone. Take selling Avon for instance, you have to buy a bunch of product by a certain date to get a great deal on it. Then you have this huge supply of stuff at home that you now have to try to sell to someone. Most of the time, it just sits and sits. With Scentsy, you don’t have to have inventory, you pay the same price as the customer, there are no time constraints. You place the order in our workstation when the customer orders and pays you for it. Then you get the commission on that order on the 10th of the following month. I’ve been selling Scentsy for 10 years and I have a large group of consultants under me from all over the US, Canada and Ireland. We use a facebook group to share ideas and help each other with suggestions. I’d love to have you join our group and start selling Scentsy too! Please let me know if you have any questions. The best thing about being a Scentsy Consultant is that I don’t have to have inventory or purchase in advance in hopes that I sell the products to make money. I place an order for products when a customer places an order with me and the Scentsy products are shipped to me. On the 10th of every month, as a Consultant, you get commission amounts loaded on your Visa Pay card, so no waiting for the check in the mail. Scentsy consultants in Canada will now be able to start using the paycard as well. Sign up to sell Scentsy and become a consultant – there’s so much training now and it really is a simple business. Just gotta be willing to share the products with others!